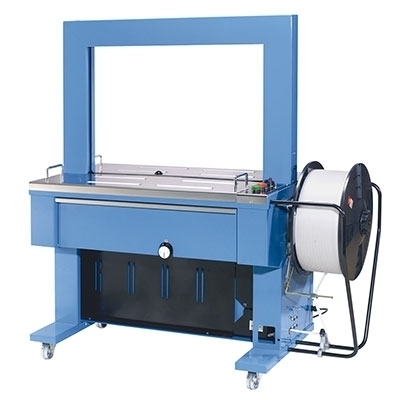 TP-6000 is an economy automatic strapping machine . It is ideal for almost every industry to minimise time in end of line strapping solutions for corrugated boxes and bundling. Since our establishment in the year 2010, in Delhi, India, We Dipack Corporation, have gained complementary expertise in the , supplying and providing service of Industrial Packaging Machines which are commonly used in end line.. Our products range includes Box Stretch Wrapping Machine, Pallet Stretch Wapping Machine, Reel Stretch Wrapping Machine, Mini Roll Stretch Wrapping Machine , Semi/Fully Automatic Strapping Machines, Shrink Wrapping Machines, Web Sealer, Pneumatic/Battery Strapping Tool, Carton Sealer, Carton Taping Machine, Continuous Band Sealer etc. Our company has been superficially acclaimed by its sophisticated customer base for providing them with good quality packaging machines. We deal in brand name as Dipack.